A little over a thousand years ago, a great community flourished within the desert mesas of northwestern New Mexico. There along twisting cliff-lined Chaco Canyon the Anasazi people established an astonishing series of settlements which included elaborately irrigated fields, an extensive system of roads, and hundreds of stone masonry structures constructed from carefully cut blocks of sandstone. Pueblo Bonito. Photo: Guillermo Aldana. Among these structures were a number of monumental multistory buildings, known today as the Great Houses of Chaco. Each contained dwelling spaces, storage rooms, a central plaza, and kivasround subterranean chambers used for ceremonial purposes. The Great Houses rose four or five stories high, and the largest of them, Pueblo Bonito, had 650 rooms upon completion. For reasons that remain a matter of debate, the settlements fell into disuse during the 1200s. An extended drought is one possible explanation. Whatever the cause, the Anasazi departed, bequeathing their remarkable constructions to the sun, the rain, and the wind. Seven hundred years later much of their accomplishment still stands. Extensively excavated during this century, the ancient ruins in Chaco Canyon now are managed by the U.S. National Park Service (NPS) which operates Chaco Culture National Historical Park, a World Heritage Site. With over eight miles of stone walls to preserve in the 34,000-acre park, the ruins present a formidable conservation challenge. Michael Taylor, an archaeologist with the NPS Southwest Region's Division of Conservation, says funding limitations have created real problems in preserving Chaco's architectural ruins. "What we're confronted with now is a diminishing budget to hire people to maintain the walls." Ironically in this semi-arid canyon, the most erosive factor in the walls' deterioration is water. In winter it comes as snow which piles up on the tops and at the base of the walls. Water percolates down from the top, freezes at night in wall cavities, and leads to buckling of the masonry. Snow melting on the ground creates a rising dampness that causes erosion at the base of the walls. To reduce these problems, snow is removed by snow blower from the tops of the walls and manually from the base of the wallshighly labor-intensive tasks. The torrential thunderstorms of summer cause similar and different problems. Rain saturating the ground leads to capillary rise into the base of the walls. In addition, the direct impact of the rain and the run-off erodes the mortar. Walls, left exposed on one side and covered with soil on the other, are subject to lateral migration of water. 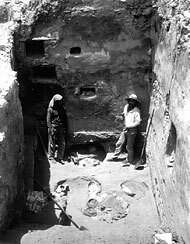 Room 62, Pueblo Bonito, excavated by the Hyde Expedition in 1896. Photo: American Museum of Natural History. "The water infiltrates, migrates to, or rises in the wall, then evaporates on the exposed side," explains Neville Agnew, GCI Special Projects Director. "Soluble salts that come out of the soil just eat away at the walls. The stone is corroding badly." The conditions described are not unique to Chaco Canyon. They occur wherever architectural ruins are left exposed to the weather. Because these problems are so pervasive and so destructive to archaeological resources, the NPS and the GCI recently initiated a collaborative project at Chaco to document and test strategies for protecting standing architectural remains. The project was predicated on the use of backfilling as a protective strategy. Backfilling involves reburying the site either wholly or partiallywith soil. While backfilling cannot stop deterioration, it can slow it down significantly by establishing a more stable environment for a site. "There's a debate going on about the extent to which archaeological sites ought to be reburied after excavation," observes Dr. Agnew. "Some archaeologists want to leave them for the public to see. This creates a huge problem of maintenance. We espouse the position that sites should be displayed only if they can be properly maintained. If they can't, they should be reburied." Backfilling actually occurred in a number of places in Chaco Canyon after excavations in the 1890s and 1920s. In order to document the benefits of backfilling in preserving archaeological remains, the NPS, as part of its collaborative project with the GCI, partially reexcavated six roomsall of which had been thoroughly photographed at the time of their original excavation. During the reexcavations, which occurred in June 1992, the rooms' present conditions were comprehensively documented before the spaces were again backfilled. The results of this effort will be reviewed over the next few months. The findings will have important implications for the future use of backfilling. "We hope to obtain some reliable data about backfilling, and demonstrate its efficacy and flexibility as a protective strategy" says Martha Demas, a GCI Training Program Fellow involved in the project. Mr. Taylor, who is the NPS's principal investigator on the project, believes NPS management now realizes that backfilling can be a viable way to preserve certain areas, especially those that are not actively being seen by visitors. It is a technique, he feels, that the public needs to understand as well. "It's a matter of making the public aware that what we're after is preserving the resourcenot covering everything up so that they can't see it," says Mr. Taylor. "We're being very selective. We don't want to backfill areas that the public really needs to see to understand the history of particular areas." As Dr. Demas points out, backfilling need not be incompatible with public presentation of a site. "There's a tendency to think that when you backfill, you have to fill up the whole site," she says. "But there are degrees of backfilling. It doesn't have to be total." At Chaco, for instance, many excavated rooms and spaces are partly backfilled while others have been left unfilled so that their full extent can be seen by visitors. Unfortunately, the resulting difference in fill levels between adjacent rooms creates problems. Besides placing unequal pressure on walls, it leaves the exposed side of a wall subject to the migration of moisture and salts from the filled side. That is exactly what happens when it rains. Pueblo Bonito, Chaco Canyon, New Mexico. Photo: Neville Agnew. To address these problems, NPS and GCI staff together developed two experimental strategies to deal with the difficulties created by partial backfilling. They also developed two strategies focused on seasonal protection of the walls from snow melt. All four strategies have applicability to other sites with standing archaeological remains. Testing of the strategies began in November 1991. Dr. Demas says that the methods were purposefully kept simple. "The intention was to design strategies that could be easily implementednot high-tech. The only thing that's high-tech about this project is the geosynthetic materials we're using." Geosynthetics is a generic term for a class of products (e.g., geotextiles and geodrains) composed of synthetic materials that perform a variety of functions, ranging from separation and filtration of soils to drainage of water. These materials, which are used extensively in civil engineering works such as road and building construction, have only begun being applied to archaeological site protection. Of the two tests dealing with backfilling, the first involves installation of a vertical geodrain on the backfilled side of a room wall to alleviate pressure on the wall, prevent water migration, and limit the capillary rise of moisture. The second test is a horizontal geodrain placed over the surface of a fill and is intended primarily to drain off surface water from rain and melted snow. Of the two tests devised for seasonal protection, one deals primarily with snow accumulation through the installation of a geodrain and an impermeable geomembrane along the base of a wall. The other test uses seasonally-installed, impermeable geomembranes to protect the tops of walls from water penetration and eliminate the need for snow removal. The first three tests are being conducted at Pueblo Bonito. The fourth test (only in place during winter months) is being done nearby at Pueblo del Arroyo, another Great House of Chaco. The tests will be monitored for four years. On the basis of a preliminary inspection conducted this spring, the wall capping appears to be effective in providing protection from the detrimental effects of snow melt. Mr. Taylor hopes that the strategies being testedcombined with the results of temporary reexcavationswill help strengthen the case for backfilling as an effective protective strategy for sites. "So many sites are exposed, and so many of them are being lost not only through natural deterioration, but vandalism. If they're not dealt with in some manner, many sites just aren't going to be around in the future."